Lincoln Financial Media looks prepared to bring Comedy to FM in Denver. 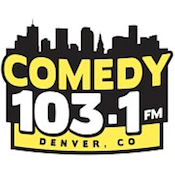 Update 10/18: “Comedy 103.1” debuted at 12pm with programming supplied by 24/7 Comedy. Update 10/17: 103.1 K276FK has begun stunting with a loop of canned laughter. As seen in the comments below, a clip of the audio can be heard here. The station will indeed become “Comedy 103.1“. Update 10/5: “Cruisin’ 950” has begun promoting that it will soon no-longer be heard on 103.1 and KYGO-HD2. The station is adding an HD2 simulcast on 104.3 KKFN-HD2. Original Report 9/19: The company has registered Comedy1031.com, 1031Comedy.com, Funny1031.com, and 1031Funny.com for 103.1 K276FK Denver. The translator currently simulcasts “Cruisin’ Oldies 950” KRWZ via 98.5 KYGO-HD2. K276FK would join semi-successful translators in Austin, Kansas City, and Santa Rosa as well as a distant rimshot in Phoenix running the Comedy format on FM. Seems it would have been more logical to put the talk(comedy is talk) format that doesn’t have the best of audio quality on 950 and leave the music format on FM. Not when you consider the average age of the Oldies format is 55+ and the Comedy format will be aiming for 25-44 who are less likely to tune to AM. The AM has bigger coverage, plus a history playing the music when it was popular under the calls KIMN, which in itself was a legendary Top-40 station in the 50s and 60s.